Held at the University of Wales campus at Caerleon, near Newport, Monmouthshire. 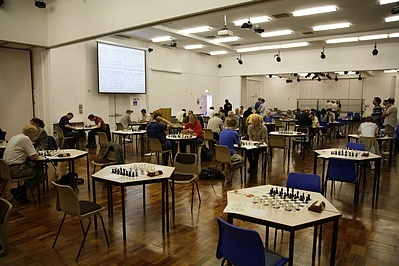 A near perfect venue, with accomodation at a reasonable price on the campus, and good playing conditions, attracting four grandmasters from England, Serbia, Russia and Uzbekistan, and 54 other chessplayers hoping for a crack at the big boys. 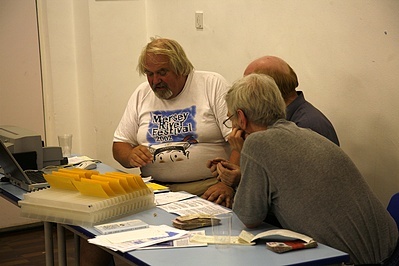 Playing hall, with the display system capable of putting up the state of play on any of the top eight boards. Some of the characters involved in the event here. The crucial last round here. More clashes in the last round here. 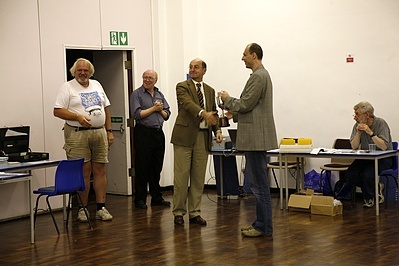 Richard Jones' last round victory over GM Dobrov of Russia here. The tournament results presented the controllers with difficult calculations regarding the prize money, with five players sharing second place. Impatient youngsters who wanted to know what was what immediately were sent packing fiercely, in order for the mathematical runes to be carried out in peace and quiet. Eventually, all was revealed, and cups and cheques duly awarded to those who had earned them. Congratulations to GM Pavlovic of Serbia, who was the outright winner - here receiving his prize from Mr D. Jiles of Magnetics Technology International, sponsor of the event.